Help the Thieves Guild get the waterfront back to normal. 300 gold, promotion to Cat Burglar, access to new fence in Bravil, Luciana Galena. Infestations of Imperial Guards cause pandemonium at the Waterfront District. After fencing 300 gold in stolen items, talk with S'Krivva. Travel to the Imperial City and locate Methredhel. Steal Hrormir's Icestaff from the Arch-Mage's private quarters at the Arcane University and place a note. Return Hrormir's Icestaff to a retired mage. Return to S'Krivva for your reward. S'Krivva in Bravil informs you that Hieronymus Lex has invaded the Waterfront District, moving a huge number of the City Watch to patrol there in hopes of finding and arresting the Gray Fox. 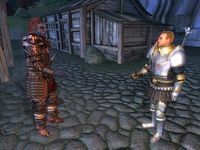 Armand Christophe has once again been placed under house arrest and many of your fellow Thieves Guild members have either been arrested or forced into hiding. S'Krivva informs you that Methredhel is coordinating the Thieves Guild's efforts in reclaiming the district. She wants you to travel to the Imperial City, locate Methredrel and help in any way that you can. 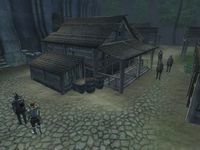 Travel to the Imperial City and follow the standard procedure of locating a beggar to get the necessary information. They will tell you that Methredrel is staying at Dynari Amnis' house in the Talos Plaza District. Proceed to Dynari's house, where you will find Methredrel. She tells you her plan to force Lex out of the Waterfront: she is coordinating five different thieves to steal five different artifacts from five different places in the city, all at the same time. She wants you to be one of these thieves and asks you to steal Hrormir's Icestaff from the room of the Arch-Mage of the Arcane University. She then wants you to place a note from the Gray Fox in his bedside table. Methredrel tells you that the Arch-Mage sleeps from 1 a.m. to 7 a.m., so go into the Arcane University during these hours. There are no guards, as they have all been reassigned by Lex to the Waterfront. In the Arch-Mage's lobby at the University there is a portal to the Council Chamber. Go through this portal, and then another one leading to the Arch-Mage's quarters. If you have come at the right time he should be asleep, with the staff on a chest at the foot of his bed. If you are not a Mages Guild member, and visit the Arch-Mage's Tower during daylight hours, the mages on each level will note that you are trespassing and ask you to leave. Active stealth mode, use chameleon or invisibility to proceed through the portals to escape detection. It is also possible to move fast enough to avoid being caught stealing. See Non-Mages Guild members for specific suggestions. If you are a Mages Guild member and have completed the missions past Liberation or Apprehension? then you have access to the Council Chamber and can enter the Arch-Mage's quarters with ease during daylight hours. See Mages Guild members for specific suggestions. Take the staff, then proceed to place the note in the bedside table. Activating the bedside table will trigger a quest message indicating you have slipped the note into the drawer through the crack. Once the note is placed, return to Methredrel at Amnis' house. Lex receives new, unwelcome orders. Methredrel will now ask you to spy on Lex until he is ordered to leave the Waterfront, eavesdrop on any conversations he has and report back to her. Travel to the Waterfront and you will find Lex among the shacks. Move near Lex until you are locked into a viewing mode. A Dremora will approach Lex and hand him a note from Raminus Polus of the University, which Lex will throw to the ground before storming off, taking his men with him. Grab the note and return to Methredrel. Methredrel will now ask that you return Hrormir's Icestaff. Going back to the University is out of the question due to the increase in guards. In order to return the staff she suggests you must sneak into the house of Ontus Vanin, a researcher for the Arcane University who lives in the Talos Plaza District. Once inside, proceed to Ontus' private quarters on the second floor and place the staff in Ontus' chest. You then have the option of taking the staff immediately back. Return to S'Krivva for a reward of 300 gold, a promotion to Cat Burglar and confirmation of your ability to access Luciana Galena in Bravil as your new fence. † These NPCs are essential and therefore cannot be killed. †† Be aware that you have to kill this NPC in The Necromancer's Amulet quest. If you are a Mages Guild member and have completed the missions past Liberation or Apprehension? then you have full access to the Council Chamber and can enter the Arch-Mage's quarters with ease during daylight hours. If you have not completed Liberation or Apprehension? and Irlav Jarol or Caranya are in the Council Chamber, you can use a Charm spell to get their disposition (already high as you are a Mages Guild member) up to 100 and stop them from harassing you. Sneaking before you go into the portal and casting from behind is a good way to do this. If you have already finished the Mages Guild quests, you're the Arch-Mage. That means you have full access to the Arch-Mage quarters. Simply go there, grab the staff (isn't considered theft from the Mages Guild, so you won't be expelled) and leave the note on your bedside table. You can be caught returning the staff. The Unofficial Oblivion Patch adds some journal entries to the quest if you're the Arch-Mage to help explain the plothole as to why you have to steal from yourself. Furthermore, if you're already the Arch-Mage, once you've finished this quest you can return to your quarters and repossess Hrormir's Staff. It does, after all, belong to you anyway. If you happen to have gone on a jaunt with the staff earlier, the Mages Guild will have thoughtfully recharged it for you. When returning the staff, Mages Guild members (especially high-level members) need to be particularly careful that they are not seen by Ontus Vanin. As explained in more detail in Ontus Vanin's article, he is likely to attack Mages Guild members on sight. If Irlav Jarol or Caranya are in the Council Chamber room when you transport in (the room between the lobby and the Arch-Mage's bedroom), they will tell you to get out and eventually attack you. If you're quick, you can get in and out before they attack. If you want to take your time, use Charm spells as necessary to get their disposition up to 100 - this may require a large boost since you are not in the Mages Guild. Stealing the staff during the wee hours when the Arch-Mage is supposed to be sleeping (1 a.m. - 7 a.m.) will minimize the chances of the other mages (Raminus Polus, Martina Floria, Julienne Fanis, Irlav Jarol, Caranya) being present in the Foyer and Council Chamber. Most members of the Arcane University are included in the list of NPCs whose death will incur a Blood Price during this quest. Therefore, be wary of simultaneously working on any other quests involving the death of Mages Guild members, such as The Necromancer's Amulet (Caranya), The Bloodworm Helm (Irlav Jarol) or Confront the King (Hannibal Traven). After you complete this quest, a special edition of the Black Horse Courier is published: Waterfront Raid Fails!. Removing the Icestaff from Ontus' Chest after placing it there and getting the quest update does not allow you to finish the quest until it is returned to the chest again, even though your journal says it has been returned. You can however, take the staff from the Arch-Mage's Quarters at a later time when it is returned there after the quest. After the quest is over you can go back to the Arch-Mage's chamber and Hrormir's Icestaff will be back in the same spot where you found it before. This is a great item to steal and fence but if you are the Arch-Mage then it does not count as stealing and cannot be fenced. You can easily steal the staff by rushing into the Arch-Mage's chamber when he is not there, taking the staff and placing the note and getting out. If you do this quickly enough, the other mages won't warn the guards or attack you. The Waterfront invasion denies you the services of all Waterfront residents: Armand Christophe's services as a Guild Doyen are temporarily disabled during this quest and you can only pay off a Blood Price or bribe away any current Bounty through S'Krivva instead. In addition, you cannot rent a room (or begin An Unexpected Voyage) aboard The Bloated Float until the guards are recalled to their regular posts. Any items placed in the Arch-Mage's chest prior to starting this mission are deleted upon its start. Instead, the Arch-Mage's clothes appear once again (an issue if the chest is being used for storage, if you have already become the Arch-Mage). The Arch-Mage's Quarters contains a potted Nirnroot plant - steal this for use in the quest Seeking Your Roots. A rumor that appears after this quest is affected by an audio glitch. An achievement will be unlocked upon being promoted to Cat Burglar. 4 A beggar reminded me that I can find S'krivva in the Lonely Suitor Lodge, or at home. 10 S'krivva tells me that Hieronymus Lex, Captain of the Imperial Watch, has pulled guards from all over the Imperial City to lockdown the Waterfront. He has vowed to remain there until someone rats out the Gray Fox. If I want to help I have to find Methredhel. She is hiding somewhere in the Imperial City. 15 Methredhel has a plan to force Hieronymus Lex to lift his seige [sic] of the Waterfront. Myself and four other Thieves Guild operatives will go on a crime spree. Each of us is assigned a high profile item to steal. I am to steal Hrormir's staff from the Archmage's room at the Arcane University. I have a note I am supposed to leave in his nightstand. 19 I have Hrormir's Icestaff. All I need to do is leave the note in the nightstand. 20 I slid the note into the Archmage's night stand. Now to get the staff back to Methredhel. 25 I gave the Icestaff to Methredhel. She says we need to wait for the nobles and wizards to act. She wants me to watch Lex until he is ordered to leave the Waterfront. I have to make sure I get close enough to him to overhear any conversations. When he does, I report back to Methredhel. 30 While spying on Hieronymus Lex, I saw a Dremora delivered a note to him. Lex has begun moving his watchmen out of the Waterfront. I think this is the signal for me to report back to Methredhel. Lex dropped that note. I wonder if I can find it? 40 I read the note that Hieronymus Lex dropped. Apparently he used guards from the Arcane University in his lockdown of the Waterfront. The wizards are blaming him for the theft of the Icestaff. 45 Methredhel has one last task for me. It's too dangerous to return Hrormir's Icestaff directly to the Arcane University. Instead, I have to put the Icestaff into a chest in Ontus Vanin's home. He is a researcher for the Arcane University and will certainly find it there. 50 I've planted the Icestaff in the chest in Ontus' bedroom. I should go see S'krivva and collect my reward. 60 Finishes quest S'krivva was very pleased. The Arcane University has forced Hieronymus Lex to break his siege of the Waterfront. She paid me the 300 gold coins she promised. I have been promoted to Cat Burglar within the Thieves Guild. 50 I've killed someone while trying to help the Thieves Guild break Lex's siege of the Waterfront. I'll have to pay the blood price. It's going to cost me 1000 gold for each murder. I can pay S'krivva. 51 S'krivva has kicked me out of the guild until I pay the blood price for my murders. I have to pay 1000 gold for each person I killed while helping Methredhel break the siege of the Waterfront. I can pay S'krivva. 55 Finishes quest S'krivva has accepted my blood price. I have been reinstated in the Thieves Guild. It is possible to use the console to advance through the quest by entering setstage TG05Misdirection stage, where stage is the number of the stage you wish to complete. It is not possible to un-complete (i.e. go back) quest stages. See SetStage for more information. Esta página foi modificada pela última vez à(s) 06h12min de 29 de março de 2016.